What’s the Next Layer on the Stack? I was privileged to speak to a class at Southern Methodist University last week on social media for nonprofits. Nina Flournoy, the charming, accomplished corporate communications professor, was taking a very practical, professionally focused approach to the material. Clearly, the bright, enthusiastic students were hungry to comprehend the marketing power of social media. As part of a slightly older generation of professionals, I am still experimenting with ways to integrate, coordinate, and differentiate somehow. But whether you are Generation X, Y or Z, I think these are questions we as marketers must address right now, in the moment. We are all trying to figure out how to weave social media tactics into the overall marketing mix—and manage them effectively. As we know, setting up a Facebook account or a Twitter profile is just the beginning—definitely not the whole story. The challenge is to embrace the social media landscape in a valuable, productive way. That is, from a business perspective, we need to find a way to aggregate the vast, messy world of social media into a usable set of metrics, messages, behaviors, and/or outcomes. As I have written in earlier posts, it’s the new success measure—ROE, return on engagement. At the end of the class, the SMU students asked me the question, “What’s next? What’s the next big thing?” What a fabulous and provocative question. There is some buzz about this among thought leaders. They suggest it is the question is really “What’s next on the stack?” We need to think about the media communication world as a stack or a progression. Many point to aggregation, dashboards for marketers, and consolidation tools. Chris Vary of Weber Shandwick and the Dallas Social Media Club says he suspects Twitter has probably peaked in terms of growth, so we should keep our eyes on the social media horizon. I have read there are 11,000 registered third party apps built on top of Twitter and probably more for Facebook; therefore, I’m thinking the cycle dictates some sort of consolidation or filtering. Thinking back on my visit to SMU, where I earned an MBA and an MA, I am dizzied and overwhelmed by the acceleration of change. When I was sitting in those same chairs in the Hughes Trigg Building (well, maybe replaced since then) twenty-ahem years ago, I was thinking about taking my box of punch cards to the guy who worked on the other side of the little window in the mainframe building. No PCs. No Internet. No email, even. Still had the old Smith-Carona and Liquid Paper, for heaven’s sake! So hard to fathom. And now, I can’t imagine a day without my iPhone and HootSuite. I guess I’m sort of a hybrid. As I wrapped up my remarks, I waxed a little nostalgic and encouraged the students to stay open, curious, and highly, highly adaptive. 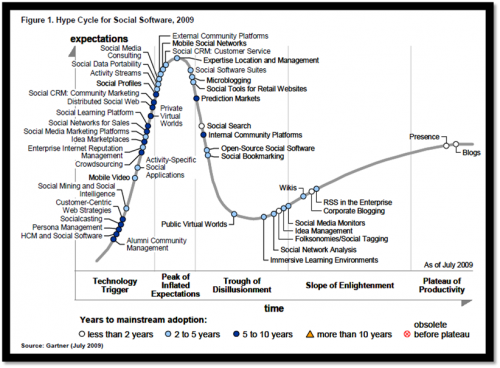 So consider this—social media as we know it right now will not be recognizable in 3-5 years. What do you think is next? Are you ready? Thanks for the wonderful post Elaine. to respond your question, I agree with Chris Vary’s comment on Tweeter reaching its peak growth but there is a lot of growth to come for them. I think that social media as a new communication tools came to stay without a question, and we will see new tools appear and build large communities and followers. But the principals of online collaboration, sharing and user generated content will be embraced over the next few years, the outcome of that could be anything…I wish I knew. However, what I think will happen from a marketing perspective is that the concept of target market will lose relevance and let the concept of multiple niche market. There is nothing new about that, the difference is that web 2.0 and social media technologies are providing more and more tools to cost-effectively reach each one of those segments. Here is another challenge, How do brands manage their consistency, identity and message with so many different niches that can be served? Jose — such great observation. I appreciate your thoughtful response. And how right you are about the brand question. I’m chewing on that as I type this. Managing chaos can be very challenging, indeed!